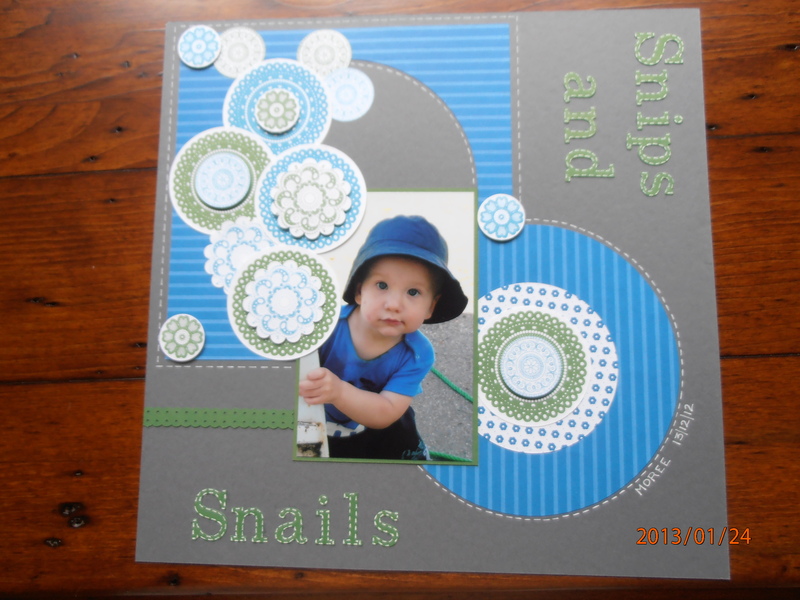 « The most exciting time in a Stampin’ Up! year is here. Being the mother of two sons there’s a special place in heaven for me. I know this because I have a plaque in my house that tells me so. More often than not I need to remind myself of this fact. Being the mother of two sons is not always easy. Actually being a mother isn’t very easy! Anyway I’m way off track from today’s post. When I spotted this LO on Pinterest I knew it was perfect to use on this photograph. This is a pic that Amber and Tony included in our Christmas pressie. It’s just a simple photo of Xavier, in their backyard but caught at an interesting moment. The railing he was playing around was a bit rusty and ‘caught the eye’ in the photo, so I used the embellishment of the cirlces to cover the distracting bit. Poor wee Xavier was recovering from a bout of chicken pox so his little face is looking a bit ‘spotty’ but that all adds to the character of the photograph. Scrapping this pic was a labour of love. I was having such a ‘bad week’ and scrapping is great therapy and working on this photo was my sanity saver. 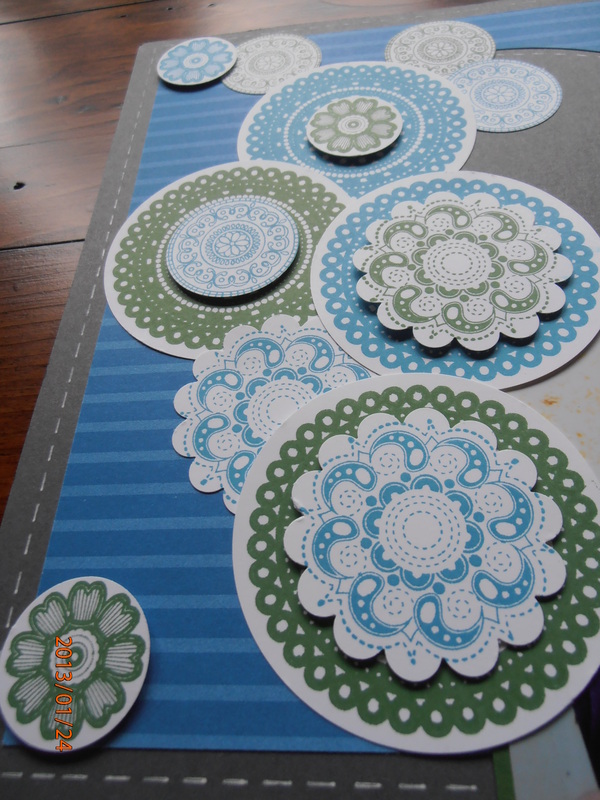 Here are some close ups showing how I used this stamp set (Lacy and Lovely featured on page 99 of the Annual Catalogue. Priced at just $33.95 clear and $42.95 for wood mount). There are four (4) circle designs which are so intricate and fine and three words – Hello, Miss you and Thank you, in this set. 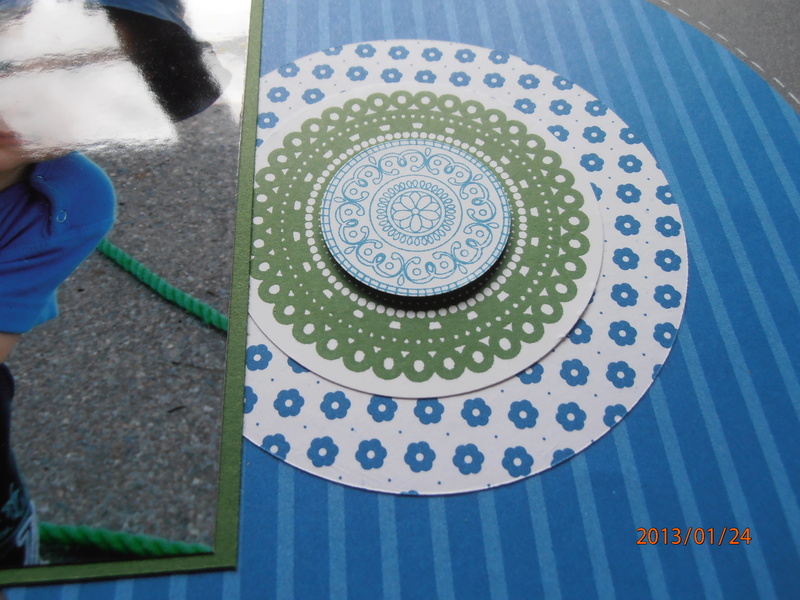 A handy stamp set for both scrapping and card making. Until next time stay happy. Oh Jacqui…..as a mother of two sons I hear ya!!!! GGggggrrrrrr I could _ _ _ _ ’em most days LOLs…..love, love the layout and you have made me love this set……..